Get paid to play: cash, technology - whadda you want? 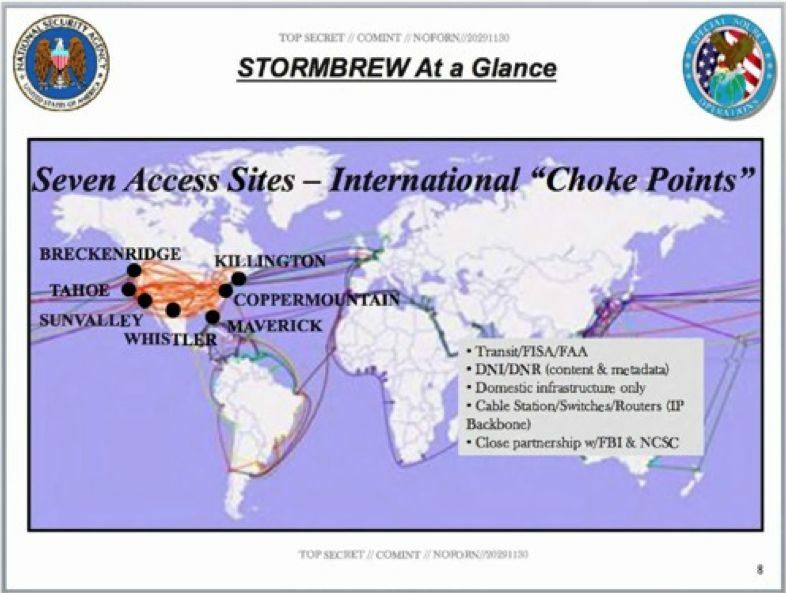 According to another slide Greenwald has published this month, STORMBREW operates seven "choke points" on international communications on the US eastern and western seaboards, each covernamed for leading US ski resorts. FAIRVIEW and STORMBREW are the covernames for the US's communications giants, AT&T and Verizon. In the UK, BT (GCHQ covername "REMEDY") and Verizon/Vodafone (GCHQ covername "GERONTIC") are described as actively intercepting their own and other companies' fibre networks, and linking them to GCHQ's processing sites at Cheltenham and Bude, Cornwall. BT and Verizon are also lavishly remunerated by GCHQ for their work in providing access to communications links in the UK, receiving payments of tens of millions of pounds annually, according to documents copied by Snowden. For the past decade, NSA has led an aggressive, multipronged effort to break widely used Internet encryption technologies ... Cryptanalytic capabilities are now coming online. Vast amounts of encrypted Internet data which have up till now been discarded are now exploitable. Major new processing systems ... must be put in place to capitalise on this opportunity. Listeners at this talk were also warned that the "groundbreaking capabilities" were "extremely fragile ... do not ask about or speculate on sources or methods". "Indoctrination" - special security briefings and signing new warnings - was required for access to information about how BULLRUN techniques work. In the creation of such arcane rituals of access to sacred secrets that no-one may know and to the power they are believed to bestow, working life inside Sigint communities can seem to resemble nothing so much as the medieval churches. Like Latin chanted by medieval priests, NSA and GCHQ's extraordinary lexicons of "covernames" revealed by Snowden are all in fact unclassified - even BULLRUN. The ordinary mortal may hear them, but must never know their meanings, which are protected behind layers of secrecy beyond Top Secret: in the US, ECI for Extremely Compartmented Information, in the UK, STRAP 1, STRAP 2 or STRAP 3. In another Snowden document prepared by NSA's Cryptanalysis and Exploitation Services unit in 2010, Project BULLRUN is described as involving "multiple sources, all of which are extremely sensitive. They include CNE [Computer Network Exploitation], interdiction, industry relationships, collaboration with other IC [Intelligence Community] entities, and advanced mathematical techniques". The covert nature of NSA's relationships and their power to influence policy and compromise internet security technologies was unguardedly summarised in a chatty top secret blog provided by NSA's Foreign Affairs Directorate in 2009 and leaked by Snowden. "What are we after with our third party relationships?" asked the spies. In summary, the answer is that they get to wiretap their own countries and their neighbours, places to which NSA and GCHQ otherwise could not legally reach. "NSA might be willing to share advanced technologies in return for that partner's willingness to do something politically risky." "In many of our foreign partners' capitals, few senior officials outside of the defence-intelligence apparatuses are witting to any SIGINT connection to the USA/NSA." Documents provided by Snowden show that GCHQ particularly prizes the data they get from Sweden, Israel and India. A year past the first revelations, the US has begun a debate, as Snowden hoped, and changes and restrictions affecting American citizens' communications have started. But for foreigners, there is nothing. In the UK and across Europe, there has been much anger but little change. 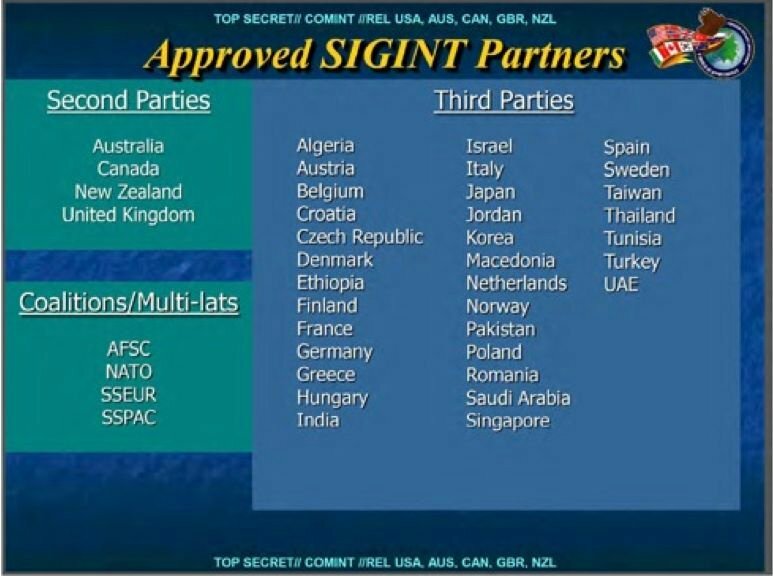 The new Snowden documents provide some of the answer, showing that virtually every EU member state has a covert surveillance "Sigint Exchange Agreement" with NSA. None of these agreements have been reported to or agreed by national parliaments. The only European countries apparently not signed up to help break the internet are Luxembourg, Switzerland, Monaco, and Ireland. And Iceland.